Your pet is more than just a pet--he's a member of your family. And it's only right to pamper him once in a while and what better way to do this than to buy him a chew toy. He would be spending hours of fun while you're buy with your chores or work. 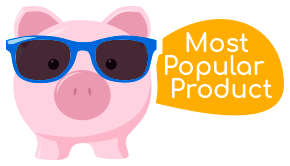 And so, we're going to discuss the different types of chew toys, what other buyers are saying, what to look out for and some of the most popular brands in the market. 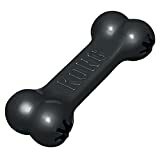 Rubber Chew Toys: So long as they’re not too flimsy, rubber chew toys often represent the safest options for many dogs. The best rubber chew toys are those that are firm enough to stand up to serious chewing, yet have enough “give” so they don’t cause tooth damage. Just make sure that the size of the toy is appropriate for your dog—the better toys come with a handy “size guide” on their packaging or on their website. Giving your dog a toy that's too small could lead to choking, while too large could lead to excessive strain and damage to their jaw and chewing muscles. Some rubber toys have hollowed-out areas where you can hide treats or stuff with your dog’s favorite canned food or peanut butter. This can provide some much-needed mental stimulation for your dog and extend the time they spend playing with their toy, especially if you freeze the food-stuffed toy before giving it to them. Edible Chews & Treats: These chews — which include things like Greenies®, QChefs®, Dentastix™, Brushing Chews®, VeggieDent® Chews, and others — don’t last very long and therefore don’t do much to satisfy a dog’s need to chew. That said, they can provide some help with your dog’s dental and oral health, as they can help minimize or slow plaque and/or tartar buildup. Just be aware that they can add a fair number of calories to your dog’s diet and should only be given in moderation, especially to a dog with a weight problem. Additionally, these can become a choking hazard or digestive obstruction if your dog bites off and swallows large chunks. Ropes: Rope toys are generally safe for the right types of chewers. However, plenty of dogs have undergone surgery to remove strands of rope from their stomach or intestines. All “foreign body” digestive obstructions are dangerous (and distressing) for dogs, but the linear foreign body type that comes from strings that make up rope toys is particularly dangerous. That’s because linear foreign body obstructions can saw through a dog’s intestines with severe, painful, and expensive consequences. If you let your dog chew on a rope toy, never let them do so without observation, never leave it laying around, and always take it away if you see the dog pulling out and eating the strands. Stuffed toys: Beware of poor-quality and cheaply constructed stuffed toys, lest the covering or stuffing winds up in your dog's intestines, where surgery might be necessary to remove it. The same caution applies to any stuffed toys that have buttons, eyes, bells, and any dangly bits. These are often the first things dogs try to rip off and possibly swallow. Regardless of what type of "stuffie" you get your dog, be sure to take it away and either fix it or throw it away if your dog manages to start "gutting" it. There are many chew toys out there that you can buy for your pet so, be careful in choosing one. Be sure to consult your veterinarian on what's best to buy for your pet. 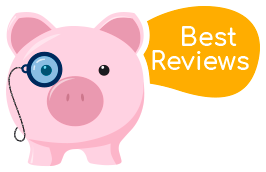 Also, be sure to read the reviews of customers to know about their experience with the toys. My 8 week old lab puppy loved this - makes a great chew toy and bounces and rolls round so he can chase and play with it. I can't see however how you could put normal treats in this... The hole at bottom is huge, everything would simply fall out! As I'd brought this to keep him occupied for longer periods than simply a chew toy, I have only given 3 stars. 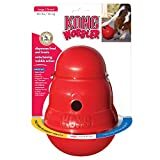 My dog loves this toy it is so strong and we have had it for over a year now and still not even a mark on it wear his other toys have last 10 minutes if that. It is fun to play fetch with and for him to just chew on I would recommend to anyone as it's hard to get a good to that lasts. When you buy a chew toy for your dog, read the materials that make up the toy as this may be harmful to your pet. For example, if the toy has stuffing, make sure that the stitches are reinforced, meaning it wouldn't open up when your pet chewed it up. Also, check in with your veterinarian on the safest chew toy that your pet should be given. 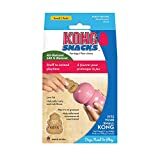 Kong - manufactures natural rubber toys that are ideal for stuffing with snacks and treats. It's great for soothing gums and it's made in the US with four sizes available--extra small, small, medium and large. Antos - manufactures vegetable dog chews that massages the gums while chewing and helps control plaque and tartar.